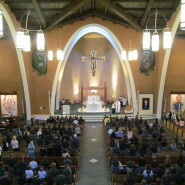 Inspired by the Loreto Sisters and their charisms – FREEDOM, JUSTICE, SINCERITY, JOY & TRUTH – our mission is to promote intellectual and spiritual growth by providing a quality Catholic education in a safe, compassionate environment, challenging all to live according to the gospel in a constantly changing world. We, the Catholic educators of SS. Simon & Jude School, recognize parents as the primary educators in the formation and education of their children. We will work in partnership with parents to build upon this foundation. We believe in our God-given mission to facilitate the growth of each child in this faith community as a whole person, with responsibilities to God, the global community, and all creation. We strive to provide each student with the opportunity to acquire a personal relationship with Jesus in an atmosphere alive with the Spirit of God. We emphasize the importance of individual potential, academic achievement, intellectual, and aesthetic growth. Believing in the uniqueness and dignity of each individual, we encourage each student to develop a strong, positive self-image by providing and expecting a Christian atmosphere characterized by understanding, respect, and acceptance of all people. We also believe every child is capable of developing moral values and self-discipline skills. We are committed to teach and model behavior which will enable our students to develop the skills to become self-disciplined, reflective, discerning Catholic Christians. We will assist in the formation of children as they grow in Freedom, Sincerity, Truthfulness, and Justice. We expect our students will find God in each life experience and go into the future embracing the honor and service of God.